Theres a very well kept secret in Moab, Utah. Its a secret Nordic skiers keep quietly to themselves. Well tell you about it even if they wont, because if you love cross-country skiing you deserve to know! The secret is the La Sal Mountains. You'll see the mountains rising over 12,000 feet to the east of Moab. Theyre often snow-capped until June, sometimes year-round. Imagine gliding in untouched powder through glistening meadows dotted with huge stands of ponderosa pine, Douglas fir, juniper, and aspen. Along your route youll encounter viewpoints down to the red rock canyons and valleys below. The best part is this: there are no people! Tag-A-Long Expeditions carefully developed a hut-to-hut ski route that allows you to play in these beautiful mountains, with terrain perfect for both cross-country and telemark skiing. The undeveloped character of this mountain range gives you the ultimate in a backcountry ski adventure. And if you havent visited Moab in the winter, youre missing out on the best and most beautiful time to visit red-rock country! There is such excellent skiing in Utah. If you have never visited any Utah resorts or hotels for skiing, have you been to any other states that have good winter activities? 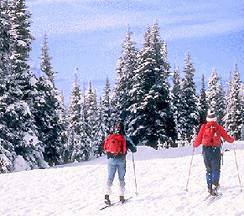 Milwaukee, WI has excellent skiing and other outdoor activities. Bordering Lake Michigan, there are many Milwaukee WI hotels and resorts that offer great winter activities. Find hotels in Milwaukee, WI for all of your skiing needs! Snowcat at one of the La Sal huts Tag-A-Long Expeditions provides three primitive huts along the Nordic ski route. While all of the huts have similar furnishings and equipment, they are not identical. They are comprised of a kitchen/dining area and a sleeping room that is in a bunkhouse-type arrangement. The toilet facilities are wilderness outhouses. The huts are equipped with table and chairs, beds with mattresses or pads, a stove for heat and cooking, gaslights, cooking equipment such as pots, pans and utensils, water, and wood or gas for stoves. Guests must bring their own food, eating utensils, sleeping bags, and personal gear. Tag-A-Long provides a suggested packing list. 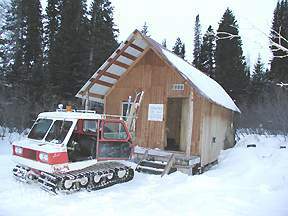 As an option, the first day of your tour Tag-A-Along will carry your gear and food in a snow cat and meet you at the first hut to go over the operation of the lights, heat and stove. This is a self-guided backcountry adventure that requires maps and compasses to navigate. The La Sal Mountain Loop Road begins only eight miles from Moab, taking you over La Sal Pass and giving you access to Dark Canyon Lake. The ski routes in the La Sal Mountains are ungroomed and unmarked except for the hut-to-hut routes that are packed on a fairly regular basis and marked with blue tipped markers. The skier designs his route from the following segments and huts. Distance: 3.5 miles from parking lot to the pass with a 1,000-foot climb. From the pass, it is 2 more miles to Tomasaki Hut with rolling terrain and moderate change in elevation. Average skiing time: 3 hours. Distance: 5.5 miles, mostly gentle up and down terrain. Average skiing time: 3.5 hours. Distance: 5 miles from the hut to the parking lot. The first 1.2 miles is an uphill climb that evens out into a gentle downhill to the parking lot. Average skiing time: 3 hours. If you plan to return from this point, you must leave a car at this parking lot. Similarly, you have the option of driving on to Beaver Lake (La Sal Pass) to take another leg to another hut. Distance: 7 miles. The first two miles are moderate up and down terrain. The next five are generally uphill with an elevation rise of 1,170 feet. Average skiing time is 5 hours. 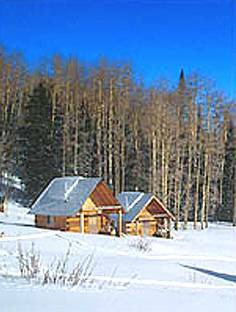 The La Sal Mountains have both cross-country skiing and telemark skiing terrain. The avalanche potential is dangerous and critical when leaving the hut-to-hut routes. Beware of potential avalanche hazards and avoid slopes of more than 30 degrees unless you are thoroughly familiar with route finding techniques and current conditions. 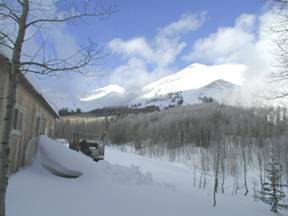 Before you leave, call (435) 259-7669 for current for avalanche conditions, snow reports and mountain forecasts. You may also go to www.avalanche.org. For those not inclined to go it alone, Tag-a-Long Expeditions offers guide service and instruction; snowcat shuttles for gear; snowcat day excursions; Hut to Hut Expeditions of two to five nights in length including guides, shuttles, food and hut accommodations; lodging reservations; ski rental information; transportation; and custom tours.